This adorable candle begins with a layer of Granny's Pie Crust, we then add a second layer of our super yummy Blueberry Pie fragrance. 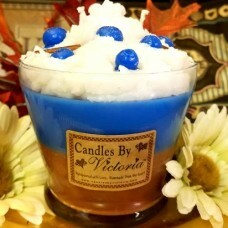 Finally, we add a whipped topping in the same Blueberry Pie scent, top it with a wax dollop embed, blueberries, rolling pins and a touch of glitter. So cute!! The candle measures 4 inches tall, it has a very wide opening of 4 inches and tapers down to 3 1/2 inches at the bottom. We love this container so much because of the wide mouth, it allows for a larger melt pool which in turn produces an outstanding scent throw! These candles come double wicked for a perfect burning candle from beginning to end. Please place this candle on a heat safe plate while burning, possible over flow can happen during the initial burn.